It's always fun to experiment with different painting techniques with Little Dude. We have tried painting with foam shapes and cars. Our window painting was a big hit. 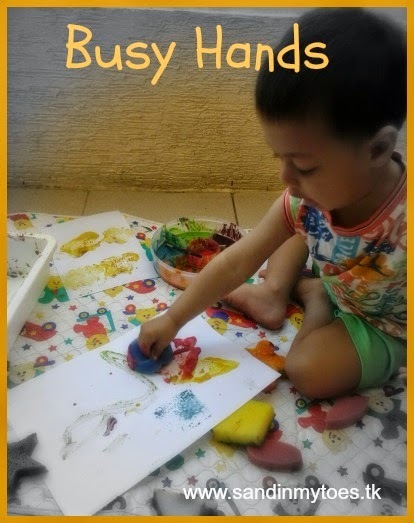 He has also started using a big brush, but he does like his fingers better! For a change, I decided to throw him a challenge by giving him regular kitchen tools to paint with. 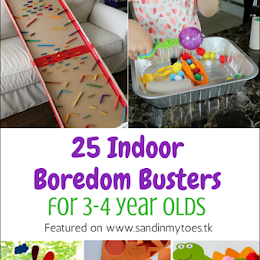 Toddlers are always curious about them anyway, so they would love it when they can get messy with them! You can see my Easy Homemade Paint recipe here. I just made the three primary colours, so he could mix them together. This would be a perfect outdoor activity, but we had to make do with indoors because it's getting very hot here, even in the early morning. Luckily, we have tiles so it's easy to do these kind of activities on our floor. Little Dude chose the most interesting one first, the potato masher! It made some cool prints on the paper. Then, he tried the turner and the skimmer. 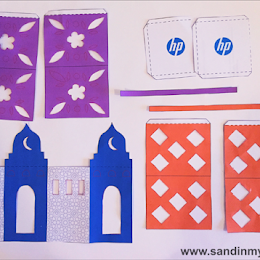 The patterns were very different from each of these, so it kept him interested. He then 'painted' with the others instead of making patterns, until he got to the juicer which made nice patterns too. This was the first time we tried 'big art' and I think Little Dude liked that he had such a large area to work on. 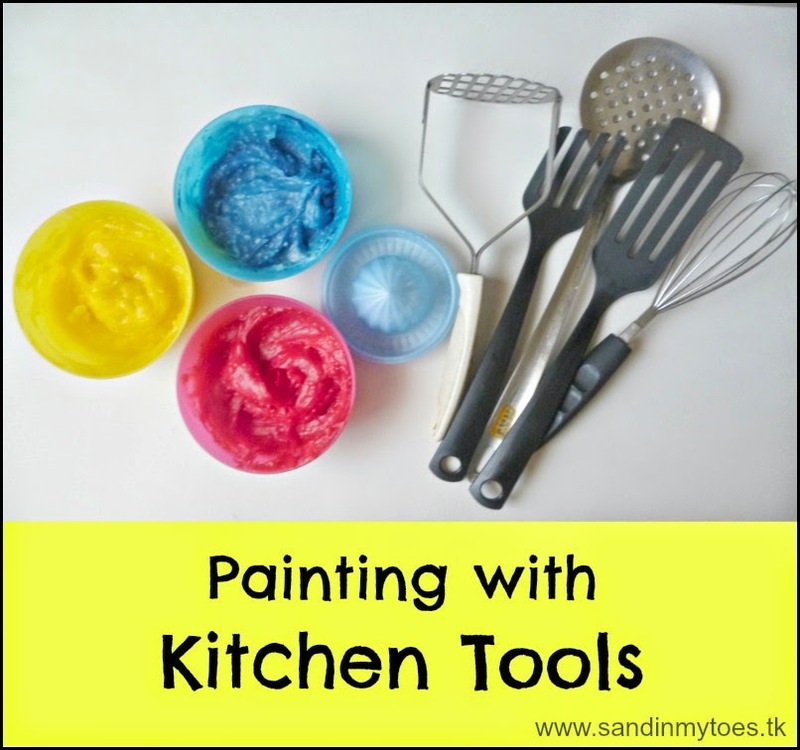 Painting with kitchen tools is a great way to explore patterns, and simply have fun! This is a great idea! I think my son is ready for "big art," and I love the idea of giving him an unorthodox "brush." Re-posting my comment because for some reason it posted from a really old account that I never use. Strange! Anyway...This is a great idea! I think my son is ready for "big art," and I love the idea of giving him an unorthodox "brush." Thanks, Clarissa! I'm always looking for things around the house for him to play with. Merlinda, maybe you can try it once a week! That's how I started out. Would he be interested in finger painting? You can try a simple flour and water paint recipe for that. This is such a cool idea! My daughter would love it, although I think I might wait a little while before actually letting her near paint! She is definitely curious about the kitchen tools already though and always wants to stand on a stool and help me whenever I do the dishes ... can't wait till she's old enough to do them for me! Fab idea and it does look fun. Kids always love exploring something new and it's always good to go big! It was really fun, especially since he had a a lot of space too! Maybe you can give them to her and have her bang on some 'drums'! Thanks, Karen. It was our first time with big art, and he loved it!